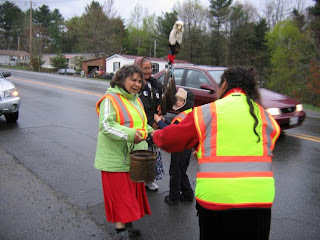 Native peoples representing the five tribes of the Wabanaki Nation of Maine and Canada gathered on May 7 at a sacred site in Machiasport to begin the Eastern Directions ceremonial walk to Bad River, Wisconsin, where they converged on June 12 with walkers from the North, South and West for a great ceremony. The mission was to raise awareness of the sacred and critical role of healthy water to all life. As an organizer with Defending Water for Life in Maine covering this region, I supported the walkers by spreading information, organizing overnight stays in Ellsworth, Etna, Athens, and Stratton, being the primary contact for Maine walkers and supporters, coordinating safety of the walkers with local police, providing guidance on the route, and by participating in the ceremony as a walker. The Water Walk has been one of the most powerful experiences I have had. There is something incredible about focusing all of your energy and intention on praying to water, healing water, and acknowledging the critical presence of water in everything… It was an amazing opportunity. a day, starting at 3:30 a.m. and ending around 7 p.m. The mission of the Anishinawbe Grandmothers that started this walk in 2003 is so aligned with the mission of our project, Defending Water for Life in Maine. We want people to be aware of water in everything. We want people and ecosystems to have the right to healthy water in their communities. Never should water be mined and sold for profit by a private corporation like Nestle. Being driven by dollars, they will never have the best interests of the community, the people, or nature in mind. For more information on the Mother Earth Water Walk, please visit the website, www.motherearthwaterwalk.com. I would also be happy to share my experiences with anyone who is interested in chatting! You can read more at the Defending Water in Maine website, here.